Bitcoin has experienced a meteoric rise in popularity since its introduction. While digital currencies were proposed as early as the 1980s, Bitcoin was the first to catch on. The total value of all Bitcoins in circulation reached $45 billion in June 2017. Its success has inspired scores of competing cryptocurrencies that follow a similar design. Bitcoin and most other cryptocurrencies do not require a central authority to validate and settle transactions. Instead, these currencies use cryptography (and an internal incentive system) to control transactions, manage the supply, and prevent fraud. Payments are validated by a decentralised network. Once confirmed, all transactions are stored digitally and recorded in a public ‘blockchain’,' which can be thought of as a distributed accounting system. The Economist (2017), “What if the bitcoin bubble bursts?”, 3 June. Babaioff, M, S Dobzinski, S Oren and A Zohar (2012), “On bitcoin and red balloons” in Proceedings of the 13th ACM Conference on Electronic Commerce, pp. 56-73. Eyal, I and E Sirer (2014), “Majority is not Enough: Bitcoin Mining is Vulnerable”, paper presented at the Eighteenth International Conference on Financial Cryptography and Data Security, Barbados, 3-7 March. 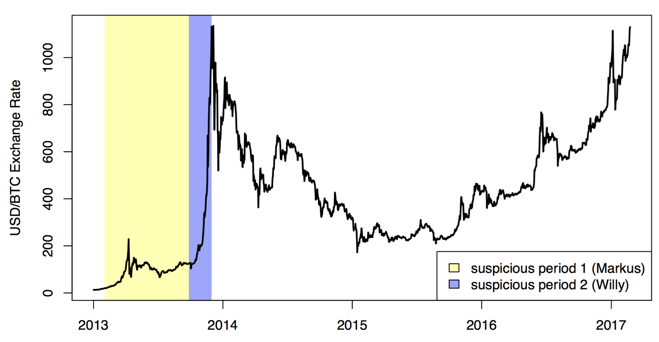 Gandal, N, J Hamrick, T Moore and T Oberman (2017), “Price Manipulation in the Bitcoin Ecosystem,” CEPR Discussion Paper No. 12061. Mooser, M, R Bohme and D Breuker (2013), “An inquiry into money laundering tools in the Bitcoin ecosystem”, in Proceedings of the Seventh APWG eCrime Re-searcher's Summit, pp. 1-14. Ron, D and A Shamir (2013), “Quantitative analysis of the full Bitcoin transaction graph”, in Financial Cryptography and Data Security, Vol. 7859 of Lecture Notes in Computer Science, pp. 6-24. Vasek, M and T Moore (2015), “There's no free lunch, even using Bitcoin: Tracking the popularity and profits of virtual currency scams”, in R Bohme and T Okamoto (eds), Financial Cryptography and Data Security, volume 8975 of Lecture Notes in Computer Science, pp. 44-61. Vasek, M, J Bonneau, R Castellucci, C Keith and T Moore (2016), “The Bitcoin brain drain: a short paper on the use and abuse of bitcoin brain wallets”, in Financial Cryptography and Data Security, Lecture Notes in Computer Science. Yuxing Huang, D, H Dharmdasani, S Meiklejohn, V Dave, C Grier, D McCoy, S Savage, N Weaver, A Snoeren and K Levchenko (2014), “Botcoin: Monetizing stolen cycles”, in Proceedings of the Network and Distributed System Security Symposium.